← Why do LCD suppliers send alternative parts to the ones ordered? How to replace the LCD screen in a Sony VAIO SV-S series. This guide will explain in detail how you can replace the screen in your Sony S series machine and dispel any concerns you may have as many of our clients actually feel daunted by this task. The major concern most people have is that it doesn't appear obvious how to remove the front bezel or frame around the screen and also that the screen's bottom part sits behind the base of the laptop. Because of these sleekly designed hinges users can feel stumped as to how to replace the screen. The videos and instructions found online don't offer help with this model as it is slightly different in design to a standard machine and the other Sony models that there are plenty of youtube videos about. First obviously you will need to find a screen for the Sony VAIO SV-S series you have, these laptops come with 13" and 15" screens and you can find a screen for your specific model here. The screen will look something like this when it arrives, note that plastics and screws are not included so you will need to think about re using these. It is important to remove the battery and power first especially from Sony machines as they have a tendency to blow fuses if you are not careful to take out the power properly first. 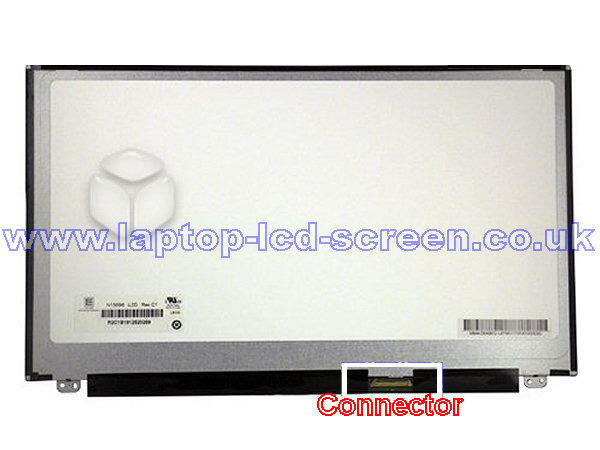 The bezel can be removed without having to take apart the base of the laptop or remove the keyboard. All you need to do is remove the two screws on the bottom left and right side of the display bezel. Remove the rubber caps first, then use a small screwdriver (you can find these jewellery screwdriver kits in PoundWorld, PoundLand, 99p stores etc). You may need to angle the screwdriver to unscrew these two screws but this is far easier than taking the lid off the base which is the alternative. Free the bezel using a lifting pressure around the inside the bezel with fingernails or with a plastic spatula or your fingernails. The front part of the bezel is stuck to the bottom of the screen with a double sided tape so be careful at the bottom lifting the bezel away. This will have to be done slowly and gently so as not to snap the bezel. Once the bezel is off you will be able to remove the cable from the back of the screen and the LCD panel will be free to remove. There are no other screws or fixings holding the screen into position, as like the new top end Apple machines these are simply glued together with tape! All you need to do now, is place your new screen into the bezel and refit the cable into the back of the screen. Pop the bezel back into place by gently pressing it together, it will "snap" back into place with a nice clicking sound. Refit the two screws and their rubber covers and you are good to go!